Everything was peaceful in the land of Vigil until Samael, the Fallen God, appeared with a terrifying army. Thus begins the story of Ascension as presented in Chronicle of the Godslayer, a game that contained neither the aforementioned Fallen God nor his slayer. By the time Samael did show up in the first expansion, Return of the Fallen, there was much deckbuilding that had been done in preparation and he was easily dispatched with. Unfortunately that didn’t end well and so more deckbuilding ensued as the rebel godling, Kythis, caused a Storm of Souls. By this point Aaron, the Godslayer, finally arrived but was dismayed to find out that Kythis hadn’t shown up yet. When Kythis finally arrived, all sorts of new mechanics had been discovered in the land of Vigil and some Immortal Heroes messed him up. With his defeat, Vigil has once again entered an era of peace… but mysterious shards have started appearing throughout the land and much rising is now in order. Ascension is a deck building game and at this point is probably best described as a game series rather than a game with a bunch of expansions (like, for instance, Dominion). 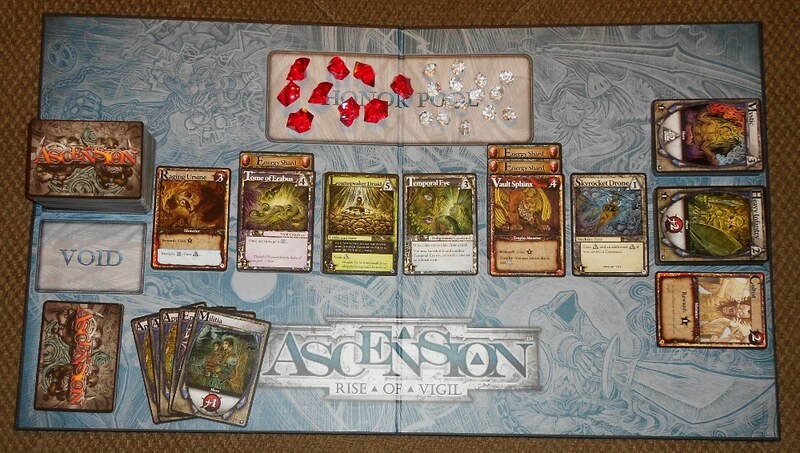 Ascension was designed to be released in blocks, each of which consist of a base game and one expansion. The original release, Chronicle of the Godslayer, is the base game for the first block. If you’re not familiar with Ascension, then you can read our review for Chronicle of the Godslayer here for a good starting point. Remember those mysterious shards that were mentioned in Ascension’s riveting plot line? The mechanics introduced in Rise of Vigil are based around those shards. There are new treasures cards representing the shards and the introduction of a third currency, Energy. The game consists of 100 new cards split between heroes and constructs from the four established factions along with monsters. 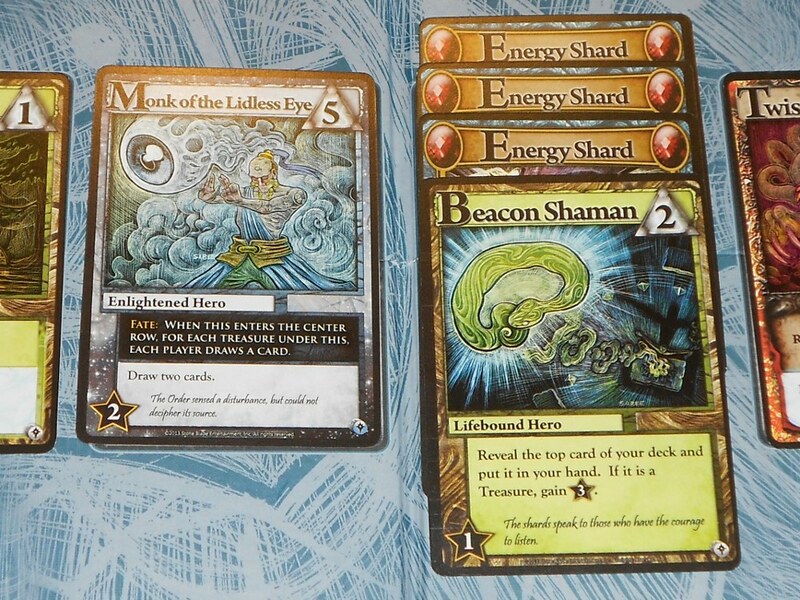 Additionally there are 30 Energy Shards that are shuffled together with these cards to create the Center Deck. The starting decks have also been modified to contain an Energy Shard in addition to the standard 8 Apprentices and 2 Militia. The Energy Shards are a new type of card, a Treasure, and are all identical. Energy shards are played just like a hero and provide 1 Energy and a card draw. Unlike heroes and constructs, Treasure cards are not purchased directly. Instead they are gained along with other cards in the Center Row as a sort of sweetener. If a Treasure card is turned up in the center row another card is then drawn and placed on top of the Treasure, continue doing this until a non-Treasure card is drawn and place that on top of all the Treasures. When a card is acquired or defeated, all Treasures under it are acquired as well. This creates some incentive to consider a card in the center row with Treasure underneath it that you might have otherwise ignored. Energize abilities require Energy to use. The other new mechanic is Energy and the Energize effects that it triggers. Energy is a third type of currency that works differently than Runes and Power. It’s somewhat misleading to call it a currency because rather than spending it, it is stored up and used to activate special Energize abilities that show up on some of the heroes, constructs, and monsters. They allow either an additional effect or a more powerful version of the standard ability on a card. Each Energize ability has an associate Energy threshold that must be reached in order to use the ability. Activating these abilities does not use up the Energy that has been generated in the current turn. Rise of Vigil is a stand-alone game but the rules explain how to mix it with other sets if that is so desired. Some players like to take the cards from some or all of their sets and mix them together into one massive Center Deck. I personally like to play the blocks as they were designed and don’t often move cards between blocks (or remove cards for that matter) so that is the perspective that I will be using to look at Rise Of Vigil. Before Rise of Vigil was released there was speculation as to whether it would include some of the mechanics introduced in the second block (Storm of Souls + Immortal Heroes), namely the Events and Fanatic. This was, in a way, a question of Ascension’s fundamental design philosophy. Would each block include the mechanics from the previous blocks alongside of any new mechanics that it brought to the table? Things could get bloated pretty quickly if they kept adding to the game without also paring down to keep things simple and clean. So there were mixed emotions when it was revealed that the Events from the second block would not be appearing in Rise of Vigil. Other notable omissions include Unite effects and Soul Gems. I, for one, am very satisfied with the result. Rather than simply being an improvement or reimplementation of what was introduced in the first and second blocks, Rise of Vigil strips the game down to the core system and introduces it’s own twists and unique mechanics that haven’t been explored yet. All set up and ready to play. Each block is in essence an exploration of the Ascension game system rather than an expansion of what came before it. This has two very positive effects. First, each block has a unique feel and is not attempting to be strictly better than the block that came before it. This gives you a compelling reasons to go back and play older blocks after you’ve had time to enjoy the newest set. Secondly, it keeps the game simple and quick, a core philosophy that plays to Ascension’s strengths. When I first looked through the cards included in Rise Of Vigil I was almost shocked by how simple they were. Being the third block I was expecting the complexity of the game to increase in order to explore new design space. I’m not saying the game play as a whole is simplified, just the effects on most of the individual cards. Rather than ramp up the complexity of the cards, the new mechanics have been introduced to challenge the way that players approach the game. I would likely point to the second block as being more complicated than what exists thus far in Rise Of Vigil. So how do the new mechanics in Rise of Vigil introduce a new play experience for Ascension? Well, most obviously there is now a third “currency” to take into consideration when building your deck. In the past, players would generally commit to a strategy emphasizing Runes or Power or try to somehow create a balance between the two currencies. With a third currency to include the balancing act is much tougher. The tricky thing is that Energy requires a much different approach than Runes and Power do. There is no always-available hero that provides Energy like the Mystic and Heavy Infantry do for Runes and Power. So a player cannot simply add Energy generating cards to their deck to fine tune the balance and herein lies one of the most compelling aspects of Rise of Vigil. You can only acquire Energy-generators when Energy Shards or one of the handful of cards that directly generate Energy show up in the Center Row. 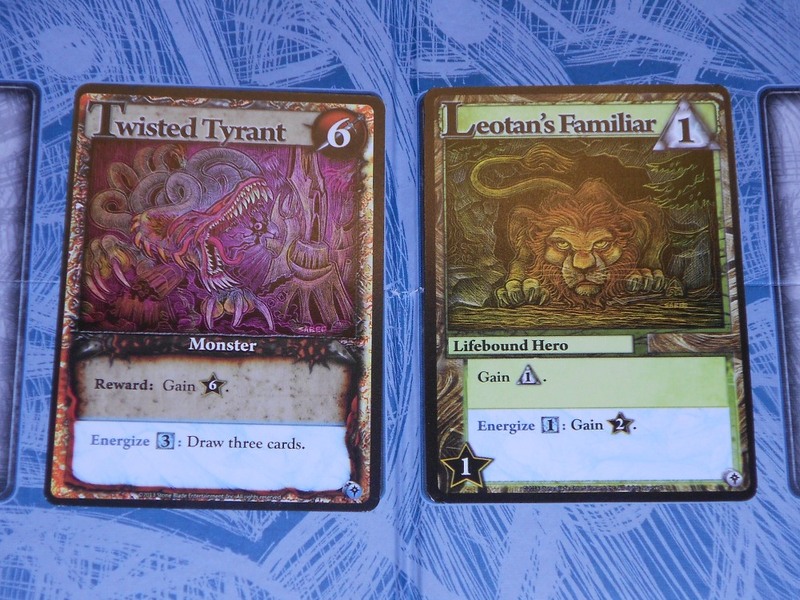 However, gaining these cards may or may not synergize well with what’s already in your deck. Unlike Runes and Power, generating a bunch of Energy doesn’t do anything unless you have cards with Energize abilities and even then you might generate way more Energy than you actually needed to trigger your Energize abilities. 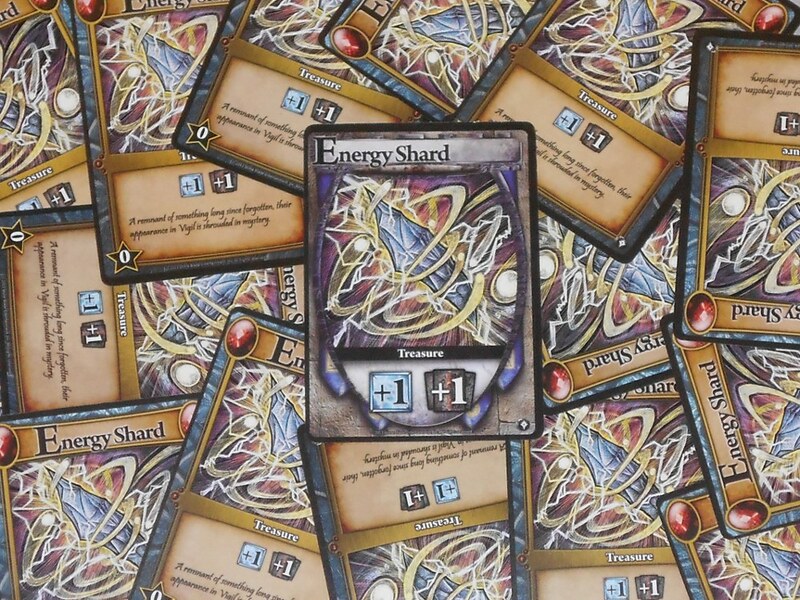 There’s a fine balance here, a few cards do want you to generate as much Energy as possible but passing up good cards to acquire Energy Shards can easily sidetrack your deck. Ideally you’d be generating exactly how much Energy is required to fire off your Energize abilities (or simply as much Energy as possible) but obviously it’s not that easy due to the fickle nature of acquiring cards that actually generate Energy. The presence of Energy Shards makes for some tough decisions: Should you grab that powerful Monk or snag a pile of Energy Shards along with that Shaman? The conclusion that I’m trying to draw here is that the presence of Energy, and specifically the Energy Shards, places a good deal more emphasis on careful consideration of what cards are in the Center Row. It’s not simply a matter of what the most powerful card is or what fits best in your deck because you are also trying to balance your ability to generate Energy. This leads to tough decisions when acquiring and defeating cards. Another subtle change that alters the way that players approach the game is the scaling back of both card draw and, to an extent, banishing powers. There are only four heroes, one construct, and two monsters for a total of 16 cards that provide card draw (excluding Energy Shards). Compare this to 25 cards from CotG and 24 cards (plus 1 Event) from SoS. For banishing there are two heroes, one construct, and one monster for a total of 12 cards that provide banishing, but 5 of these cards only have the banishing ability at an Energize cost. For reference there were a total of 12 cards from Chronicle of the Godslayer and 12 cards (plus 1 Event) from Storm of Souls that provide banishing. The main difference here are the banishing powers that only trigger at an Energy cost and thus may not provide banishing every time they show up. Not a huge change but combined with the lowered card draw, you’ve got a pretty fundamental shift in how often and how consistently you’re actually going to be able to play your key cards. This further emphasizes the importance of carefully planning which cards you are actually adding to your deck. You’re generally going to have to deal with those pesky Militia and Apprentices more often so hitting any reasonably powerful combo requires excellent planning. Just imagine what this guy does! I mentioned earlier how Rise of Vigil was almost shockingly simple. I want to come back and emphasize why I think this is so important. One aspect is the accessibility that is provided as a result of keeping a limited set of mechanics. When teaching a new player, you only need to explain the basic mechanics which include the new rules for Treasures and Energy. There’s no need to touch on Events, Soul Gems, Unite effects, or anything else from the previous sets that don’t show up here. Then simply explain the cards as the come up in the Center Row and players can quickly pick up how to play the game without getting overloaded with too much information. It’s only slightly more complicated than explaining Chronicle of the Godslayer which is saying a lot. Another aspect that simplicity provides is really placing the new mechanics at the forefront and letting them shine. You don’t have a bunch of rules from older sets that are competing for your attention, the focus of this set is clearly on Energy and how to best harness and utilize it. Even the mechanics that did carry over from the previous blocks such as Trophy Monsters and Fate are used sparingly to support the theme of this set. For instance the Trophy Monsters provide Energy when they are banished and the Fate effects all deal with how many Treasures are under the Fate card when it enters the center row. This is both exciting for veteran players looking for a new experience and necessary for creating a distinct feel for this block. Lastly, the emphasis of simplicity seems to address some of the complaints that were raised with Soul of Storms, especially once Immortal Heroes was included. Mainly, turns near the end of the game could become rather complicated and would take a long time to resolve. This is almost a non-issue in Rise of Vigil. The scaling back of banishing and card draw abilities really keeps turns short and sweet. The presence of powerful cards and stockpiling of Energy to trigger Energize effects still creates the feeling of building up towards a climax near the end of the game but it doesn’t take playing 20 heroes per turn to do so. I love Storm of Souls, but the simplicity of Rise of Vigil is a breath of fresh air after getting used to the crazy engine building that was very common in the second block. 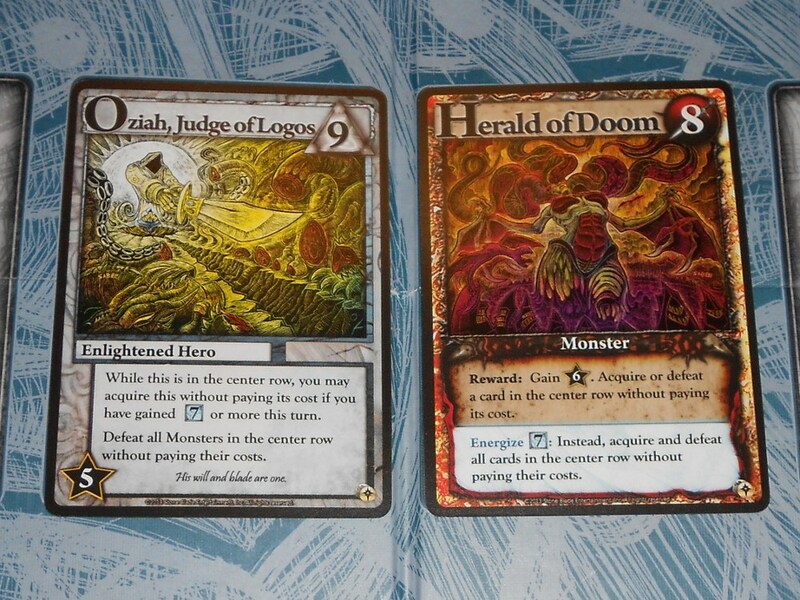 Artwork from the three main sets (from left to right): Chronicle of the Godslayer, Storm of Souls, and Rise of Vigil. The art in Rise of Vigil is absolutely top-notch, taking another step forward from the already excellent second block. 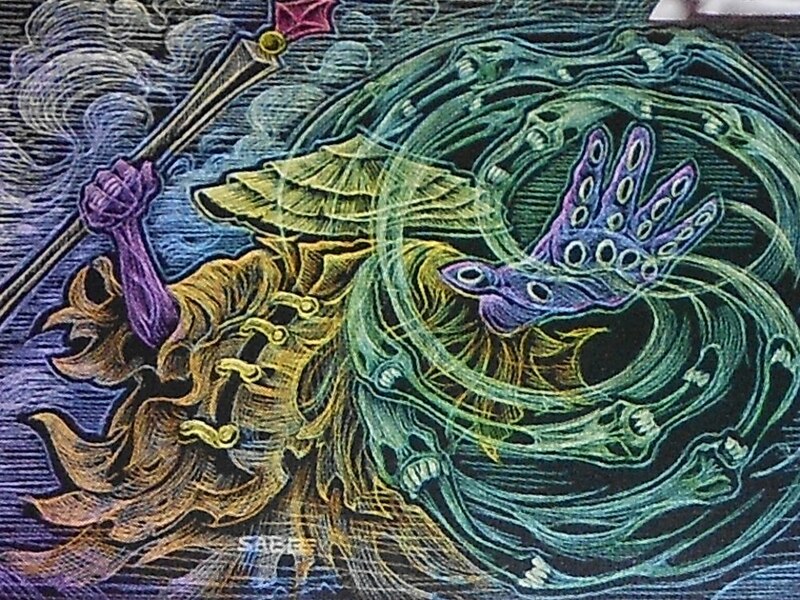 Eric Sabee’s artwork has been steadily improving and Rise of Vigil sees him executing his unique style flawless in all facets of the game. The cards look vibrant and really pull you into the game world whether you’re familiar with the story or not. The board has been changed to a much friendly tone of blue (from tan/brown) and the different areas really pop nicely. There is another set of the basic cards: Apprentices, Militia, Mystics, and Heavy infantry but as in Storm of Souls these cards are all given new art to reinforce the theme of the block. This is a nice way to provide the essential cards that are required to make it a stand-alone game but still offer something new to the people that already own the previous sets. What Rise of Vigil does not do is cater to players that have a problem with the occasionally swingy nature of Ascension. I absolutely do not consider this to be a problem and there are many ways to mitigate and control things so that you won’t be so dependent on luck. But if you feel that Ascension is too luck dependent, this set is not going to change your mind. The high cost cards are especially powerful in this set, and I’ve seen them absolutely dominate a game. However, once players become familiar with what’s coming these threats can be greatly diminished. These guys can both clear the whole Center Row. 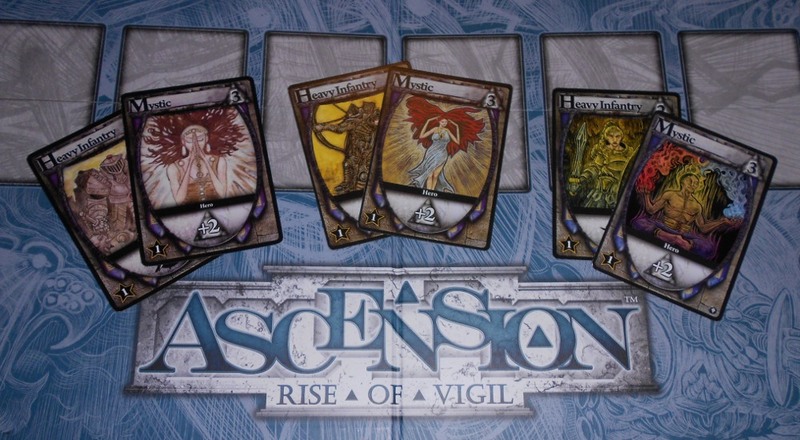 The bottom line is that Rise of Vigil provides an excellent and unique experience built on the core mechanics of Ascension. 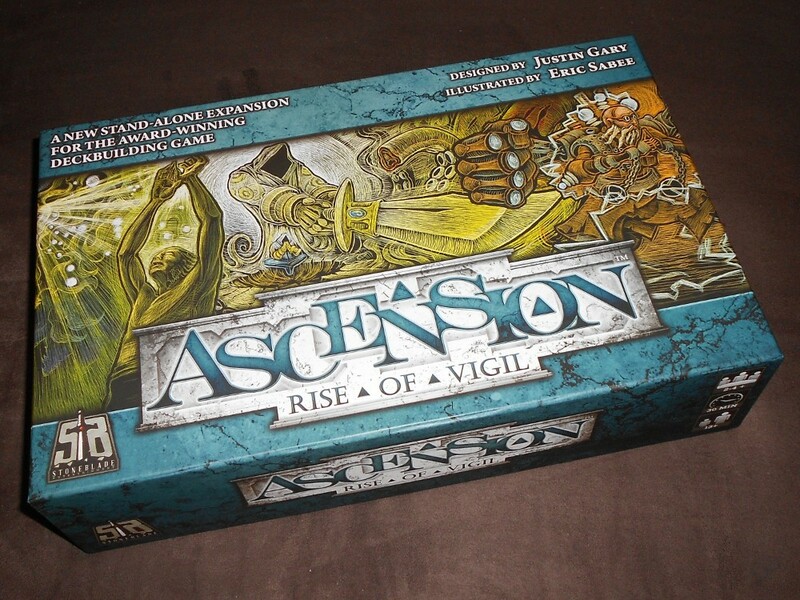 New and experienced players alike will find something to enjoy in this set which can be used as a great entry point into the world of Ascension. Nice! I’m going to have to check this one out. We picked up Storm of Souls but really didn’t play it too much for reasons I’m not completely sure of. I think the base game just felt easier to teach to new people. I’m very intrigued by the energy mechanic. It seems like it’d make the game even more swingy, which is completely fine by me, part of the fun of ascension has always been seeing what’s going to come up next.